Pulse Entertainment Productions Owned by Avatar PR Presents A whole New Breed of Reality TV: Made to Model Reality TV Show! With a chance to win L$200,000, (approximately $800.00 USD) to jump start a modeling career in Second Life, luxury living in the M2M Mansion at the grove rent free for one month, modeling contracts with SL Vogue and Avante Modeling Agency, a feature in Nu Vibez Magazine - including a photo session, a paid scholarship to SL Vogue Modeling Academy and other fabulous perks and high profile exposure. Avatar PR is going all out for one lucky winner. You don’t even need to have prior modeling experience. This competition is open to anyone with a desire to be a top SL Model. 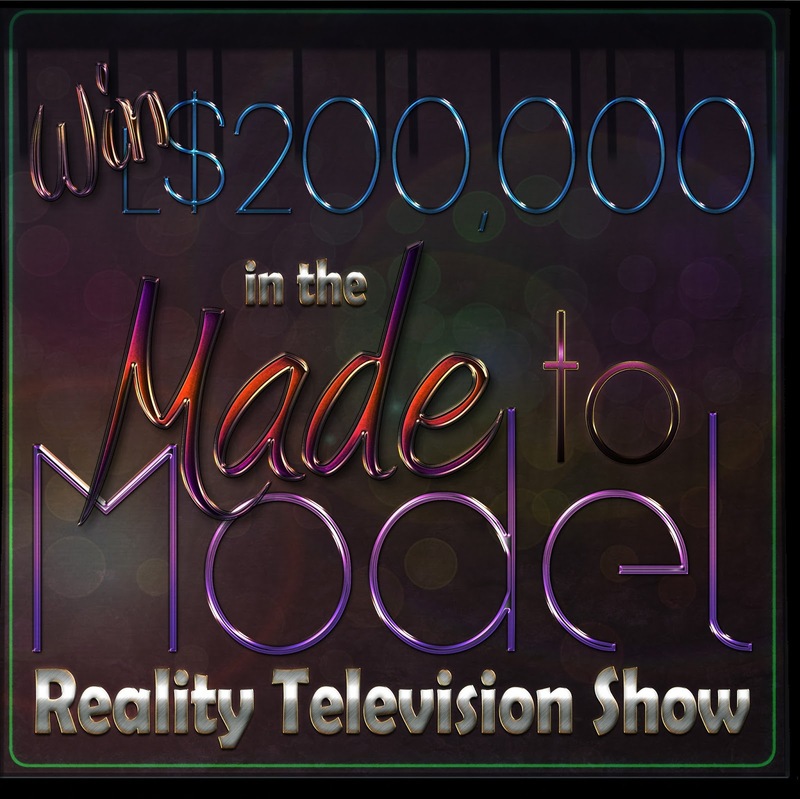 Made to Model Reality TV Show will feature 14 contestants competing in challenges which including modeling, runway, photography sessions and more. To make the competition more dramatic, every contestant will wear the Life HUD version 2.0 throughout the competition for added reality TV show effects and day to day human tasks. Details for each episode will be provided as they air weekly on iMoogi.tv and YouTube. They determine which contestant will be sent home until there is just one remaining to be crowned the first ever Miss Made to Model! Are you up for the challenge? This competition is offering one lucky winner VIP prizes that will catapult their Modeling Career in Second Life. How can Model hopefuls register to be a contestant? We have the registration boards up in the Made to Model Headquarters at The Grove Country Club Estates. These boards are more than just an entry task for the girls, they are a tool that can be used for the girls who make it, during the competition, to save them from elimination. The boards maintain a tally of popularity votes, and only the votes that happen on the boards, truly count toward a model's salvation. Just as a model's power comes in the people she can inspire to make a purchase of a designer's wares, how many she can motivate to vote for her on her board shows a glimmer into her abilities and value as a Made to Model winner. Anyone can enter the competition, but how do you narrow it down to 14 contestants what criteria must they exhibit to qualify in the selection process? We select from those who gain 50 votes or more, and our choices are based on personality, desire to compete, desire to win and intelligence. Once a model reaches 50 votes, she is given a personal interview by several members of the staff and production team. She's advised of what to expect and critiqued for how she reacts to this information and her availability. If chosen at this phase, she is then incorporated into various PR events and photographic opportunities we provide, to test her mettle, her ability to follow direction and to see how hard she works all while the show is marketed by the visibility of the contestants. If she makes it through this phase, she is a Made to Model contestant and will be on the show. Any points she earns during this pre-show competing, are tallied into her "salvation points" and saved for when she might need them on the show. What is the Life HUD version 2.0 that each contestant will be wearing? What does it do? Oh Life Hud is very exciting. If you've ever played The Sims™ by EA Games, you'll get it! Just like in that game, the Life Hud adds to your avatar, basic human bodily needs on a meter, that you need to keep after, such as the need to eat, cleanliness and other bodily functions. More recent version of the Hud includes health ... your avatar can actually get sick! Oh, and careers ... their are careers built into this, that satisfy human needs such as happiness, the need to achieve and succeed and so on. We believe this will add to the show in ways that you just can't get in virtual worlds without it! Besides, its a lot of fun and surprisingly to me, many of the girls already had their huds, they already "played the game." Life Hud has provided the food needed during the show to keep the girl's tummy's from rumbling and the house's appliances will be suitably scripted and fully Life Hud enabled providing the girls with most of what they need to succeed. To give contestants a little insight on how the elimination process works, what do they have to watch out for to lessen their chances of being sent home? We have some of the most talented and amazing hosts and judges on the show. They have extensive experience in the Second Life Modeling and Fashion communities and include Miss Emma Portilo, formerly COO of Opium Modeling Agency; QueenToy Cyberstar, founder and owner of SL Vogue; and Miss Kimmera Madison, Fashion Designer & Founder of Tres Beau designs and the lady who formerly ran the Miss Virtual World Competition and Boulevard Agency. These are the three ladies who the contestants need most to impress, although some episodes will have special guest judges for specific challenges, and those wont be announced until it happens! The judges will be watching the girls for their ability to learn and grow, their viability on camera, ability to take direction, skill in front of a camera, skill in styling and many more elements that go into being a top fashion model in Second Life. Oh, and lets not forget the ever dreaded, popularity scoring that will include social media and tools we provide on the Made to Model website. Aside from the grand prize of L$200,000 Lindens, can you elaborate on the Grand Prize package? Well the money is lovely, but yes, there is more to it. As a winner, Miss Made to Model will be moved into the Made to Model mansion at The Grove Country Club Estates, as her home, and she will be granted the ability to live there, free rent, for a month. When the month is up, she will be given first dibs on renting that home before we make it publicly available. While living in the ultimate in SL luxury, she will begin her career by attending the illustrious SL Vogue Modeling Academy, on a fully paid scholarship, followed by paid modeling gigs as an SL Vogue Agency Model. With that, she also becomes an Avante Modeling Agency model and will be found often in the pages of Nu Vibez Magazine starting with a feature article, interview and photo session designed to catapult her into the public eye. Scheduling and Time management is a challenge in itself when it comes to SL Competitions. With that being said, Can you tell us about the filming process and approximately how much time will contestants need to dedicate to this competition? When we begin filming, it will be done straight through until we're done. We film all episodes back to back, go into post-production, get the episodes ready for prime-time THEN, we will release one a week ... just like they do in RL. There will be a period of several weeks the girls will need to be ready to work and the filming schedule will be posted to the girls. They'll know the base times when they need to be on set and ready to get down and dirty in the competition. 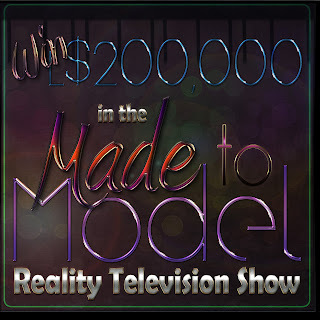 Who are the sponsors of Made to Model Reality TV Show and what are their contributions? We have some amazing sponsors, we cannot thank them enough. First and foremost, thank you to The Grove Country Club Estates which is providing us with the lovely parcel on which we built the custom Made to Model Mansion, and their generosity of the free rent prize to the winner. Then, there's LIFE HUD of course, providing the Life Hud 2.0 system and the food and tools needed to "play". There are a few sponsors we're working on right now but they're not quite ready to be mentioned them. There's still time to become a sponsor and take advantage of the PR and visibility that comes from working with this show and our group. The information's available on our website. When is filming expected to begin? We're in the midst of gearing up with pre-show PR and selection challenges and getting all the final details in order. The filming will begin in January, giving everyone the chance to get through the holiday crazies and to take advantage of that slow period that happens just after the holidays are over. During the competition and filming of the show, will models be supplied with a wardrobe selection from the sponsors or will the models have to come up with their own styles and outfit choices? The contestants have already experienced this with our Halloween photo-shoot for Nu Vibez Magazine ... when we have a photo-shoot where we insist on what they wear, we provide all attire. Also, we are lining up fashion designers who will be providing attire and who may appear on the show too (don't want to give too much away) as guest judges and challenge leaders. These Designers will be announced soon, but a they include Paris Metro Couture and Tres Beau for certain! What else can you tell our readers about what to expect from Made to Model Reality TV Show without giving too much away? Fun ... Reality TV Drama ... high quality, creative filming that's enjoyable to watch ... the ability to affect the outcome by voting for the ladies and so much more. 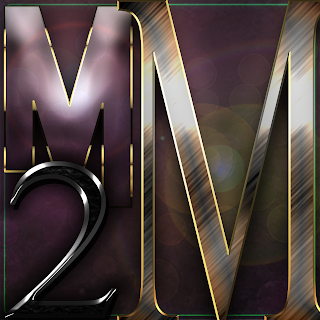 If you are someone interested in participating in such a way, get yourself in the Made to Model group inside Second Life as a fan, so that you know when we put out the call for votes and you can potentially find yourself as an extra on the show!